Are you quite acquainted with the customs and traditions of Diwali? Well this festival is not only about lighting of diyas and oil lamps, it is has lot more things to be done. Many traditions and customs are duly attached with the celebration. Different form of arrangements are needed so as to make this festival worth celebrating. Continue reading to find out more about the customs and get a better understanding about the festival. After reading make sure you refer this page to your friends by clicking here so that your friends as well get a better understanding about the festival. The word 'Diwali' is derived from a Sanskrit word which literally means ‘a row of lamps’. Thus it is the festival which is well known for the light and brightness that it spreads everywhere. It is the festival where amidst all traditions and customs, fire crackers and chocolate bombs rule the main. Hence these vital parts of this festival surely add a sparkled ambience to the celebration. It can thus surely be said that the festival of Diwali is a pan India festival hence is observed with utmost devotion and joy. It is the festival that celebrates the victory of good over evil and knowledge over darkness. However there are many legends which are duly associated with this festival, the most common legend is the one that deals with the return of Rama to Ayodhya after a span of fourteen years of exile. The victory of Krishna over Narakasura is also another legend associated with the celebration. In the eastern part of India, the festival is celebrated to honour the victory of goddess kali over Bakasura. Not only Goddess Kali is showered with prayers and mantras on the day of Diwali, prayers are also offered to Goddess Lakshmi, the goddess of wealth and prosperity. It is common believe amongst every Hindu households that those who offer prayers and puja to Goddess Lakshmi will surely be blessed with prosperity and wealth. Thus a puja dedicating to Goddess Lakshmi is performed on the Diwali evening in all households so as to seek her blessings. Another vital tradition that is duly associated with the celebration of this festival is lighting of diyas or oil/ghee lamps. 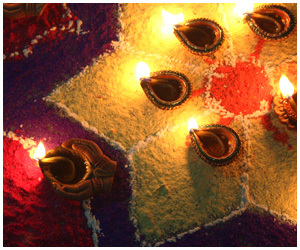 This tradition of lighting up of diyas is followed once the Lakshmi puja is over. People start decorating their houses with lighted lamps and diyas. However there is a symbolic connotation that is duly attached with this particular tradition of lighting of lamps for it symbolises getting rid of darkness from the world. According to the mythological stories there’s a common believe that people of Ayodhya decorated the whole town with diyas or lamps on the day Lord Rama returned from the fourteen years of exile. Thus in order to welcome him back home, diyas and lights were lightened everywhere and since then this tradition has managed to maintain a strong foothold in the celebration of Diwali. Moreover another prevalent symbolism is attached with the lighting of the diyas for it is a common believe that as Diwali falls on a no-moon night, lamps help Goddess Lakshmi to reach their households. Hence, people leave the diyas to burn all through the night so to direct Goddess Lakshmi towards their doorsteps. Another prevalent tradition that is observed in some of the villages is the worshipping of cattle by respective farmers. According to this Diwali tradition, farmers generally worship their cattle for they are their primary source of wealth and hence are considered to be equal to God. Mostly the southern part of India, cows are worshipped on this day for they are regarded as the incarnation of Goddess Lakshmi. 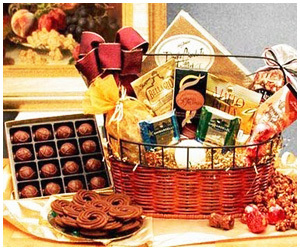 Another tradition that is duly associated with the celebration of Diwali is the tradition of exchanging gifts. Thus this particular festival makes shopping as a part and parcel of this auspicious festival. In order to gift ones loved one the best, people indulges in shopping, buying clothes or other accessories so that this particular tradition is just fully observed. Diwali is also considered an auspicious occasion to buy gold. Conceived from a Sanskrit word, 'rangoli' refers to a decorative design that is prepared with the help of colors. The patterns are typically created with materials like that of colored rice, dry flour, (colored) sand or even flower petals. During Diwali, people clean the houses and decorate the courtyards, walls and entrances with hangings, torans and colourful rangolis, meant for the sacred welcoming of Goddess Lakshmi. Diwali celebration is not complete without fireworks and crackers. Bursting of fire crackers are the vital and integral part of this festival of light. However there is a symbolism attached with the bursting of crackers for it is believed that busting of crackers will keep away all evil spirits from home, thus bringing in prosperity and wealth. Thus in order to get a proper understanding of the tradition and custom of this festival A pandit is duly consulted who informs the devotees about the timings and rituals that needed to be considered. The general things that are needed for a diwali puja are silver and gold coins, suparis, uncooked Rice, paan leaves, kumkum for applying tilak, mithaai (Indian sweets), camphor, agarbattis (incense sticks), dry fruit (almonds, cashews), flower petals and Lakshmi-Ganesh icon. The puja ritual is performed in the evening when tiny diyas of clay are lit to drive away the shadows of evil spirits. Bhajans are sung in praise of the goddess and sweets are offered to her. Diwali puja consists of a combined puja of five deities: Ganesha is worshipped at the beginning of every auspicious act as Vighnaharta; Goddess Lakshmi is worshipped in her three forms Mahalakshmi, the goddess of wealth and money, Mahasaraswati, the goddess of books and learning and Mahakali. People also worship 'Kuber'- the treasurer of the gods.